To 90cm height by 45cm spread. Forms clumps of fountain-like foliage from which taller flower spikes grow. Flowers summer to early autumn. 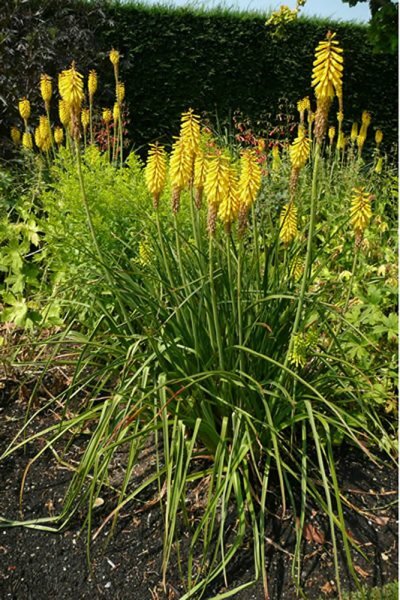 Kniphofia plants like well drained, sandy or loam soil that remains moist thoughout the summer (they can survive drought but won’t flower well) and has a neutral or acidic pH. Prefers a south-facing spot and is happy with exposed areas, including coastal conditions. 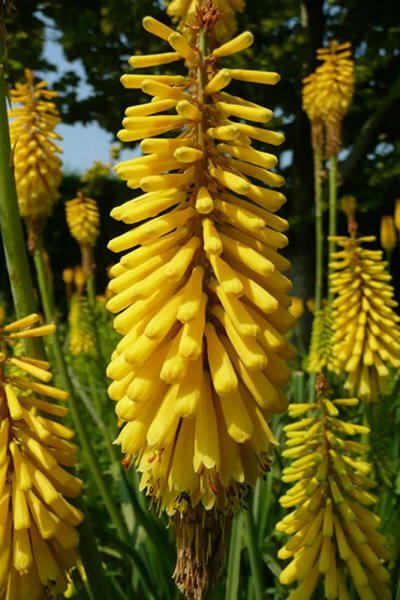 Long leaves froth out from the central clump, while erect stems appear in summer tipped with dense spikes of deep yellow, tubular flowers. Great in the middle of borders, particularly those with a hot colour scheme, where they will shoot up like fireworks. Can be used in cottage-style gardens or more urban designs and makes good cut flowers. They will suit mediterranean, gravel or coastal gardens and are low maintenance plants. They can also benefit wildlife as bees enjoy their nectar and some birds feed on their pollen. When planting, dig humus into the soil to enrich it. An organic mulch applied each autumn would benefit the plant. Once planted, except for minimal pruning, these plants are relatively low maintenance. However, you should ensure that they are watered in dry spells as they prefer a moist (albeit well drained) soil. Prune out any flowered stems from the base. You can also remove any tatty or dead leaves. Clumps can be divided in mid to late spring. Large sections can be immediately re-planted, but smaller sections should be potted up and grown on for a year before planting out. Seeds can be collected in autumn (cultivars may not come true from seed) and sown in spring at 15°C. May be attacked by slugs, snails or thrips. Violet root rot also occasionally affects Kniphofia. If the plant isn’t flowering well, it may be that it is not getting enough sun and/or that the soil around it has been allowed to dry out. The genus Kniphofia is named after Johann H. Kniphof (1704–1763), a German botanist. This plant was developed by Sunningdale Nurseries in 1968 and has been given the Award of Garden Merit by the RHS.